Our Solid-Handle Poms feature a large paddle-shaped handle, allowing for maximum advertising impact. 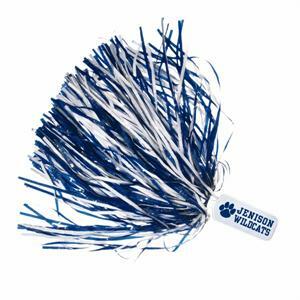 The poms come standard with 500, 12" plastic streamers in either solid or up to 4 mixed colors. add metallic glitter streamers for extra sparkle to your pom. • Extra-large imprint area: 3 3/8" x 1 3/8". • Generous 4" x 1 3/4"- sized unbreakable molded plastic handle. • 500 - count 3/16" streamer pom. • 750 - count streamer available for 30 cents more. • Up to four mixed streamer colors at no additional charge. • 7/16'' wide-cut 220 - count streamers available instead of the thin strands. • Available with sparkling Glitter Streamers for 50 cents more. Price includes 1 color print on both sides of the handles. If you do not have camera ready art, we can set up your simple text & stock logo for $10.